New Account Savings! Just Steps To The Water's Edge! Central A/C, Washer/Dryer and Remodeled! Account Savings! The lucky new owners of this immaculate Ocean Front condo have only acquired it a few days ago so they are busy putting their final touches on it so that you can have one of the nicest places to enjoy in Maalaea! Lovely Prime Ocean Front at the popular Maalaea Kai Complex! A superbly remodeled 2 br/ba condo literally 10 steps to the waters edge. From your kitchen, dining room, living room and lanai you can revel over the sights of the Maalaea Bay, the majestic volcano "Haleakala" and the sparkling and romantic Kihei lights across the bay at night. The property provides an Aloha ambiance with tiki torches at night and the sounds of the surf. Breath in the fresh ocean air and feel the sun and the tropical cooling breeze while sipping your favorite tropical Mai Tai mix. 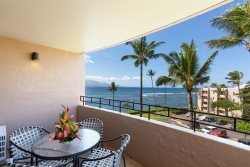 There are very few condos on Maui that are situated this close to the water where you can conveniently walk right out your lanai door straight to the lounges, the newly renovated pool, BBQ's and what about that beautiful lawn that looks just like a golf course! There is plenty of tables and seating at the BBQ area for dining and there is also a public restroom in the lobby near the pool for your convenience. Your assigned parking is also conveniently located nearby the condo so it's easy to get too and from with no hauling yourself and items up and down an elevator. The entire place is tastefully decorated with the spirit of Aloha in mind. It has central A/C for keeping you comfortable during your stay. Bedroom suite provides a comfy King bed, cable tv and it's own updated en-suite bathroom (tub/shower combo). Guest bedroom also has comfy twin beds (can be made into a king upon request). Updated guest baths, one with a tiled walk in shower and the other has a tub/shower combo. Shared Laundry Facilities are conveniently located on each floor (pay per use with credit card or pre paid card only) Spacious remodeled kitchen was meticulously designed for the cook in mind, corian counters and stainless steal appliances and everything one would need. Living room has a large flat screen with cable tv and free, secured wifi. Condo also provides for your fun... beach chairs, beach umbrella, beach towels, binoculars for whale watching and a cooler for your excursions. What more could you ask for...book today! Fantastic condo! We really enjoyed our stay here! The condo is beautifully decorated and updated. So clean and pretty! We had all of the beach items we needed and even though I stated that the missing binoculars was not a big deal, they went out of their way to make sure we had them within a day! We saw turtles every day and whales right from the beautiful Lanai. I wasnt sure about the location at first but I would absolutely stay here again! Its quiet and pretty much within 20-30 minutes of most Maui highlights! Highly reccommend!!! Beautiful!! It is challenging to find a place on Maui right on the water with a view like this AND with modern furnishings. I love Hawaii but am not a fan of the 1970's decor that so many of the places have. This place is gorgeous!!! Loved the place- loved the view- and for my needs, the location was central and perfect.